This collection of essays examines the aspects of the modernization process and its religious, social, environmental and political consequences. Modernization, in this sense, means the growth and diffusion of a distinctive set of institutions and values rooted in the technological transformation of the economy and the organization of the state. 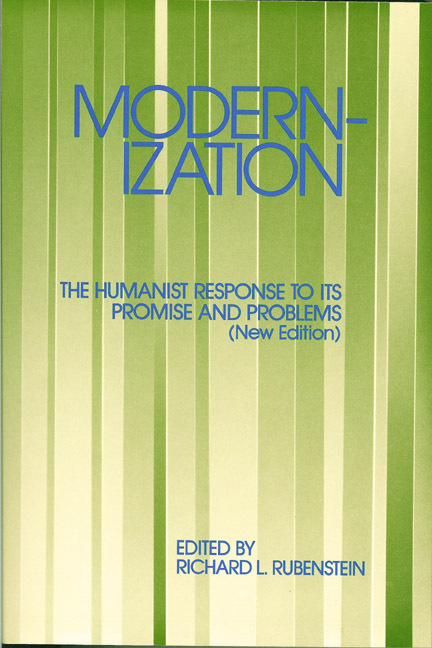 Alternatively, modernization can be understood as an expression of the triumph of functional rationality, a rationality of means rather than ends as the predominant mode of problem-solving in human affairs. RICHARD L. RUBENSTEIN, a theologian and historian, is the President of the University of Bridgeport, Connecticut. He is the author of numerous books including After Auschwitz: Radical Theology and Contemporary Judaism, The Religious Imagination, Morality and Eros, My Brother Paul, Power Struggle, The Cunning of History, and The Age of Triage.